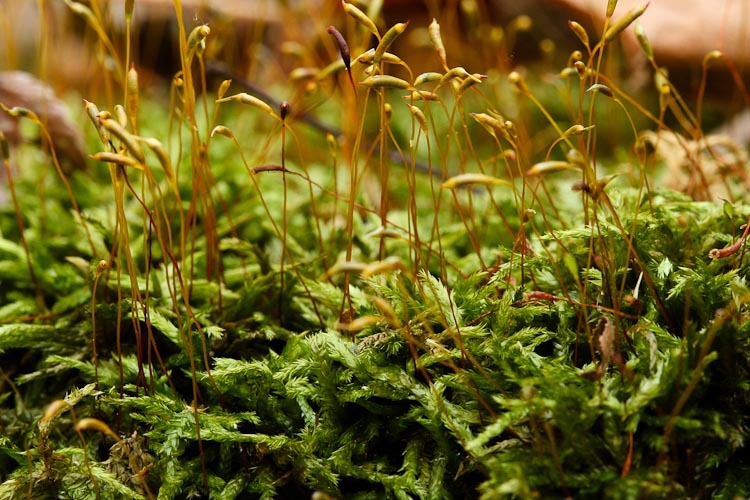 Many otherwise forest-minded folk are uncharacteristically clueless when it comes to mosses. “I don’t know my mosses” is a familiar assertion. But why? Heck, they’re plants, and most mosses are quite different from one another. The problem seems to be their small size. Indeed, if mosses were enlarged to the size of trees, they’d be easier to tell apart than are many trees. (Oaks and hickories come to mind as being none too easy, even though they’re huge.). Below, see pics of the leaves of two Plagiomnium (Mnium in older books) mosses. 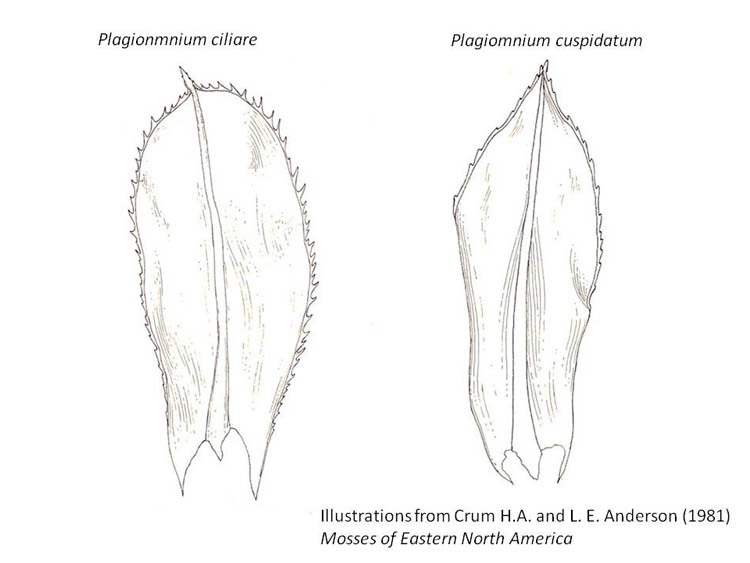 On the left, Plagiomnium ciliare has leaves toothed all the way to the base, while on the right, P. cuspidatum is toothed only 1/2 way down the margin. Easy to tell apart! I. Acrocarps (cushion mosses) versus pleurocarps (carpet mosses). 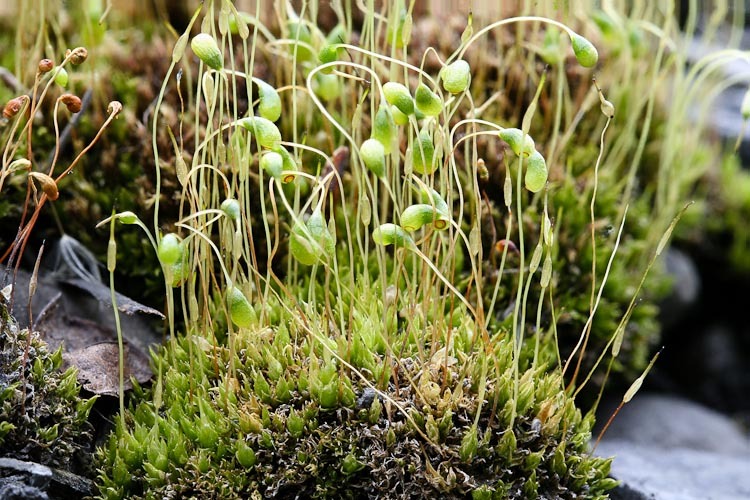 Mosses are often described according to their overall growth form, as belonging to one of two broad categories: (1) acrocarps (“cushion mosses”), which are erect with sporophytes at the tips (tops) of the stems, and; (2) pleurocarps (“carpet mosses”), which generally lay flat and are much-branched, with sporophytes produced at intervals in the axils of the branches. Funaria hygrometrica is a distinctive acrocarp. 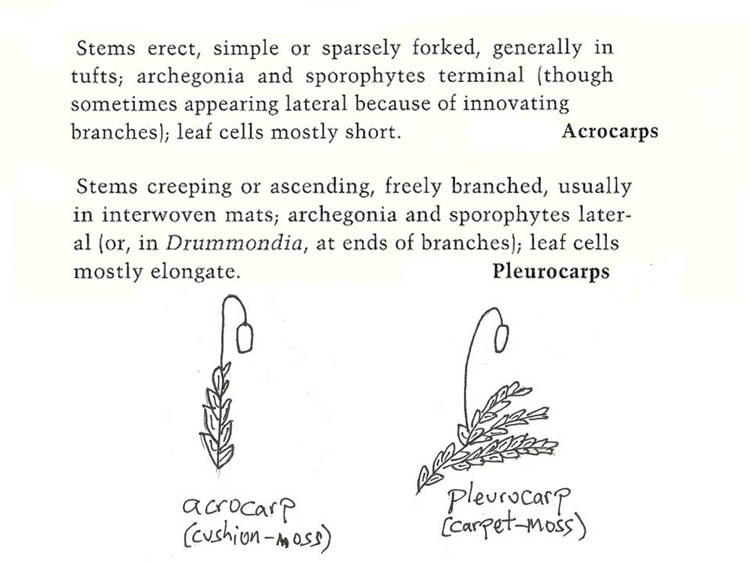 Note the separate upright gametophyte stems, situated side-by-side, atop from which issue forth sporophytes. 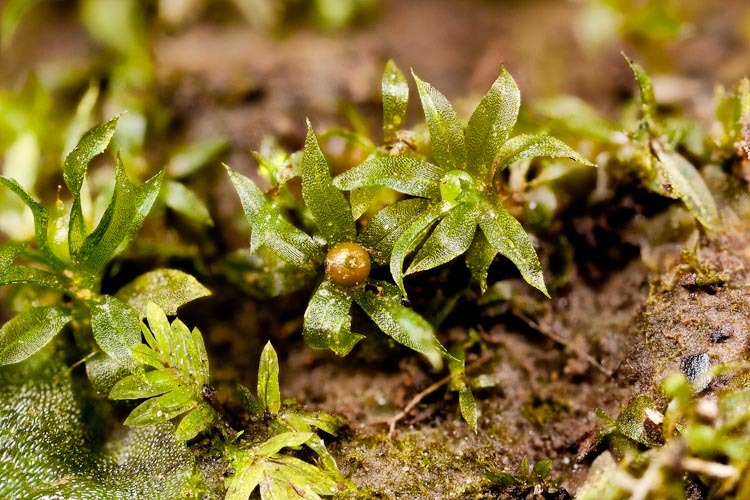 Funaria hygrometrica is an acrocarp (cushion moss). 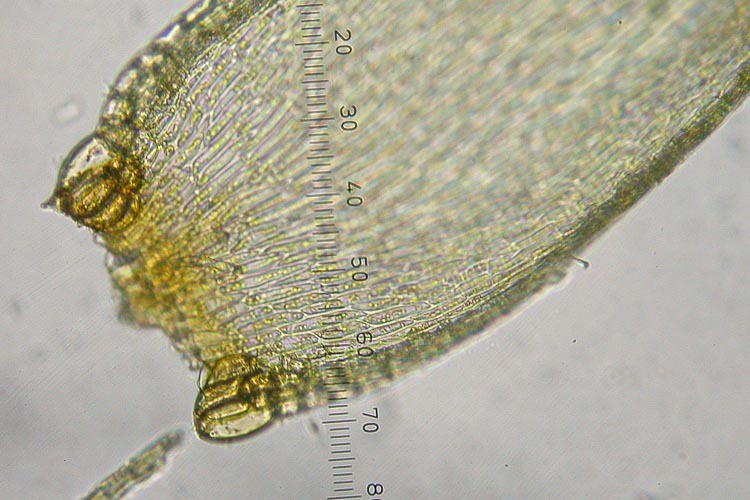 Callicladium haldanianum is a typical pleurocarp. See how the gametophyte stems are branched and somewhat horizontally arranged, with sporophytes produced in the junctures of the branches and stems. II. 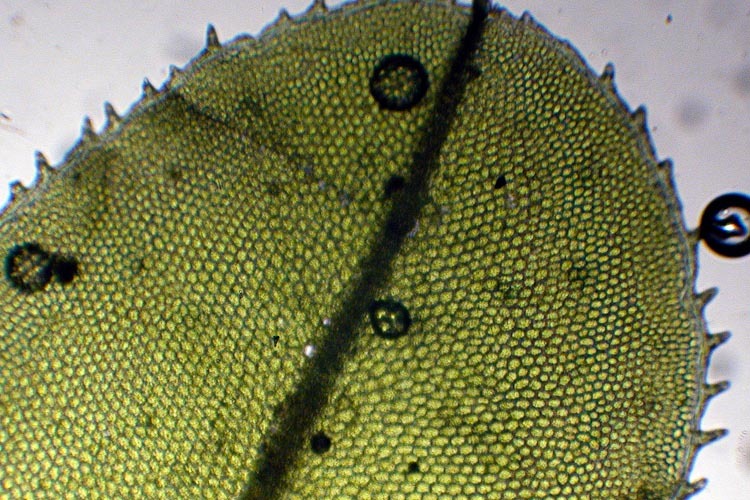 Leaf cells papillose or smooth. Papillose leaves have bumps or projections of some sort. Smooth leaves don’t. Anomodon attenuatus is a pluripapillose (i.e., with many small bumps over each cell) pleuropcarp. 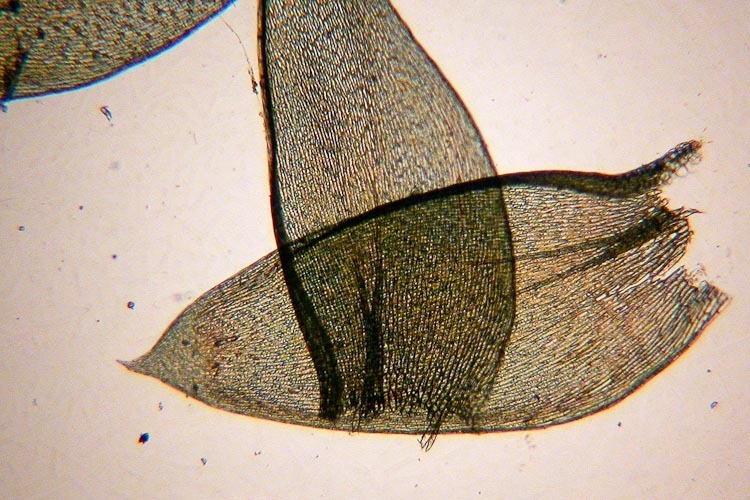 The leaf cells of Philonotis marchica are papillose by means of upwardly-projecting cell ends. 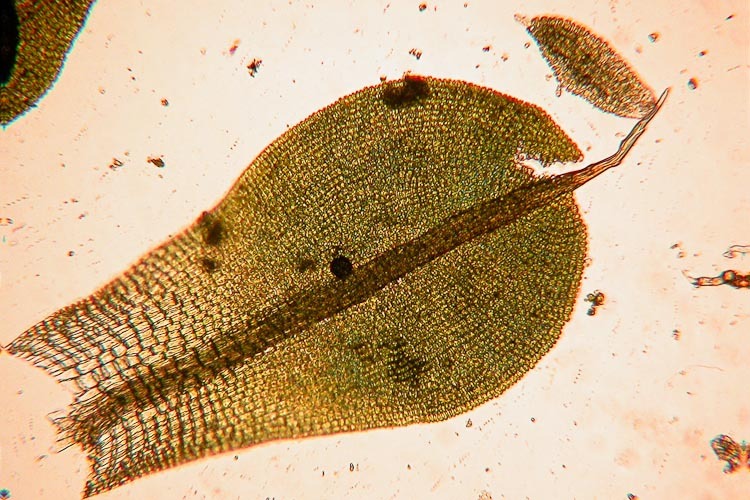 The leaf cells of Funaria are smooth. 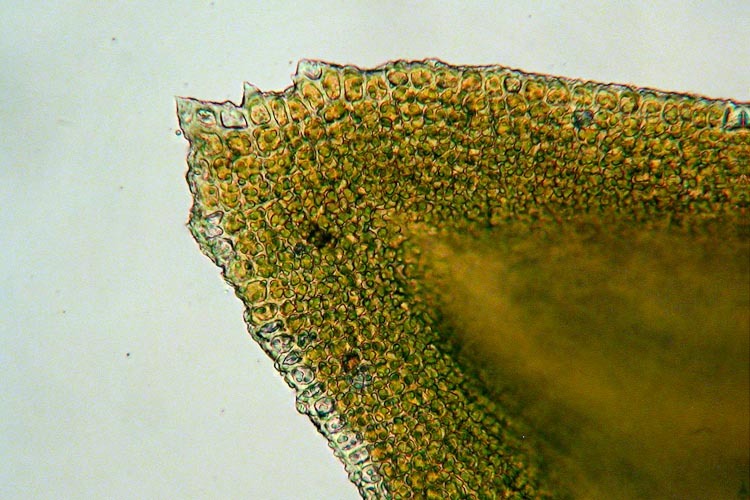 Funaria leaf cells have no bumps (smooth). III. Leaves with or without a costa (mid-vein). 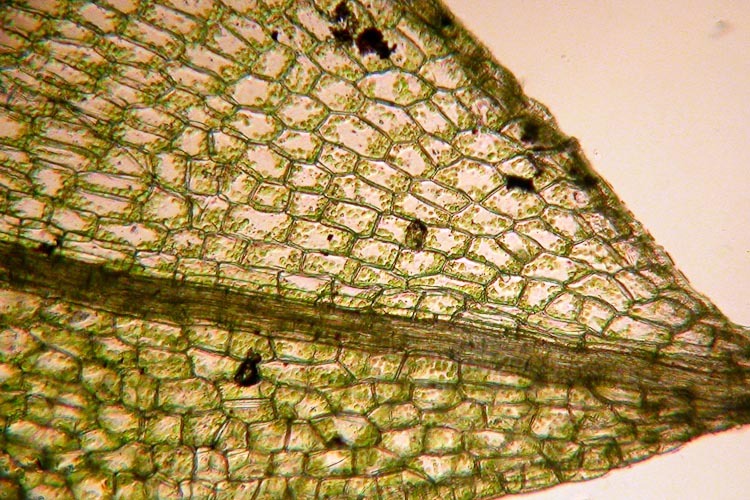 Because mosses are non-vascular, it would be inaccurate to say a moss leaf has a mid-vein, but many mosses do have a median strip of additional cells that have a supporting (but not conductive) function. This moss mid-vein that isn’t a mid-vein is called a costa. Some species of mosses have a costa, and its length my be helpful in identification. In some instances the costa may even project past the leaf tip as an awn. 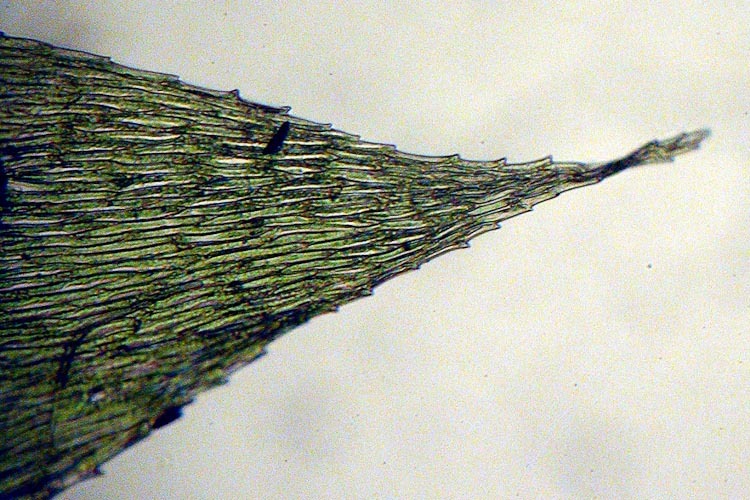 The leaf of Syntrichia laevipila has a costa that extends as an awn at the leaf tip. The leaves of Plagiothecium denticulatum have a costa that is short and double. IV. Leaf cell shape and size. This is where a compound microscope really comes in handy. Seen at 100X to 400X, carefully examine the relative length and width of the cells. Cells that are more or less equal-sided are soiad to be isodiametric. The cells of Plagiomnium ciliare are equal-sided (isodiametric). Other species have cells that are long and narrow (often expressed as a ratio such as “cells greater than 5:1”). 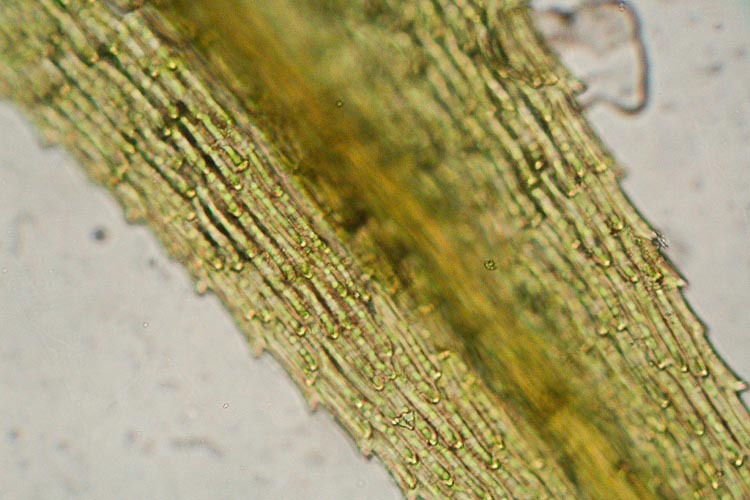 The cells of Rhynchostegium serrulatum are long and narrow. Often, the cells at the lower corners of the leaves are differentiated, either by having thickened cell walls and thus looking like little patches of bricks, or by being enlarged and inflated, like little balloons. Cells in this region of the leaf, differentiated or not, are called alar cells. Specialization in this region is often associated with changes in the orientation of the leaves that occurs when the moss is hydrated. The alar cells of Phyasidelphia tenuirostris are inflated. Pylaisidelpha tenuirostris has inflated alar cells. V. Length of sporophyte seta. 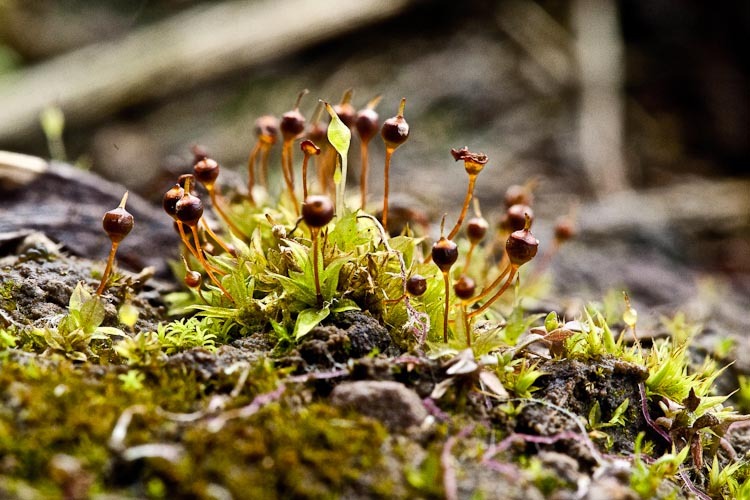 Many mosses, if they produce sporophytes, elevate their sporangia (capsule) atop an elongate seta. Others have an especially short seta, such that the capsule is immersed in the upper leaves. Sporophytes of the rare ephemeral moss of wet fallow farmland, Physcomitrium collenchymatum, have an elongate seta. Physcomitirum sporophytes have an elongate seta. close relative of Physcomitrium and grows in the same habitat as it. Aphanorrhegma is distinctive by virtue of its immersed capsules (miniscule seta). Aphanorreghma serratum sporophytes have an immersed capsule (miniscule seta).